Have you seen these “fidget spinners”? Every kid in America has at least one now. Six months ago, almost nobody had one! 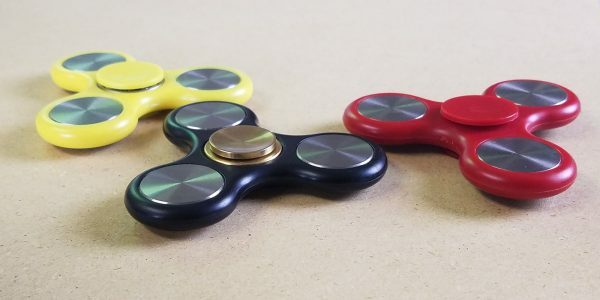 The peak of the spinner craze has come and gone. They used to cost about $15, then $12, then $10, and eventually $5 each. Now you can buy them on eBay for a buck. Well … any time someone is spending money, what is there? An 80/20 curve! Most people don’t care at all about spinners. Some will spend $5 if they think they’re cool. That’s the low end of the curve. 80/20 says that some people will spend much more than that if they find one they think is really cool. Now, in case you didn’t know, the only thing that spinners do is spin. You hold them by the pads at the center and fidget with it and spin it. Thus the name. So, if that’s all a spinner does, what makes a cool one cool? What would make it worth a lot more to an aficionado? You can Google that, too and see all kinds of answers to the question. Loads of different colors and designs, most of which perform about the same. Give it a spin and it goes a minute or two, maybe three. Being abnormally geeky (once an engineer, always an engineer), I began to wonder how long you could get one to spin if you put your mind to it. This turned into kind of a weird hobby project for me. One of my customers (RollerBob.com) happens to sell inline skate wheels and bearings. It turns out the bearings used in most spinners are the same as those used in most inline skates. So we started looking at bearings. We quickly learned that good bearings spin longer than bad bearings (duh) but you really can’t get amazing results just using better bearings. So I started to look at the weights. Seems obvious that more weight would make a spinner spin longer. This made me think of tungsten, which is very dense and is often used for small weights. 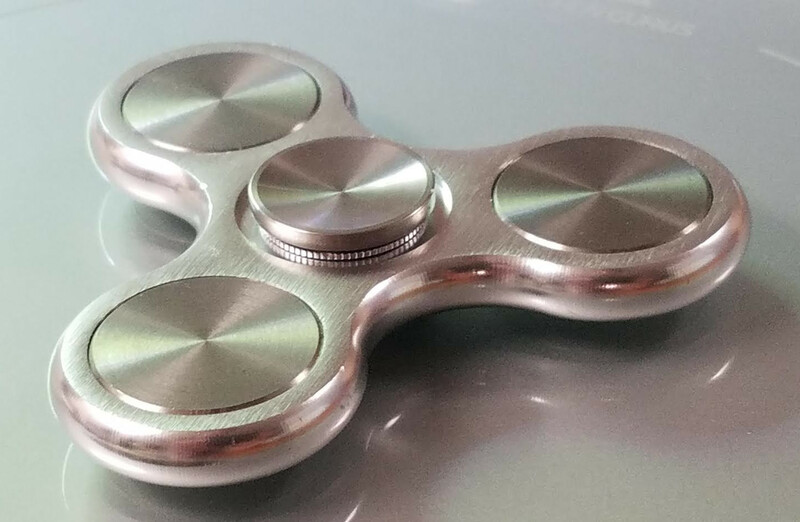 So why not put tungsten weights in a spinner? I looked around and found that no one had gotten serious with this semi-exotic metal before, so I decided to give it a shot. Just for fun, we had a dozen tungsten weights made up special just for us. We pushed out the old 10g weights from a fidget spinner, and pressed in our shiny new 45g tungsten weights. Suddenly our spinner that only spun about 3 minutes before would now spin 9 minutes! We put a super hot bearing in it and now it spun over 13 minutes! And it felt totally different in your hand than any other spinner. But it didn’t look cool. It was just black plastic with some upgrades (check it in the picture above). If we were going to market this, it would have to look cool, too. That’s when we found some nice shiny aluminum frames that look just amazing with our slick tungsten weights. But what to do with our marvelous Frankenstein? Well, we tried putting the weights on Amazon, and sold a few but not a lot. Unfortunately, tungsten is expensive. We had to set the retail price at $50 for three little weights. Still, some people are buying them! There’s the 80/20 of it all right there. If a lot of people are spending a little, there will be a few people spending a lot – if the value is there! In this case, the value is in super long spin times, and a really cool super heavy spinner. My next attempt at distribution was in Games by James stores. If you live in Minnesota like I do, this is a very familiar name. They’re in all the malls, including the Mall of America. Other than that, they have one store in Wisconsin and that’s it. They sell all kinds of fun things to play with and actually made a killing with fidget spinners! They got in really early and had dozens of models you could actually try before you buy. During the peak in popularity, spinners accounted for over half their sales! So I picked a good outlet. They took a small amount of inventory, and are doing a trial. They’re not exactly flying off the shelves, but they are actually moving. Remember, the weights alone retail for $50. We had to price our spinner at $79.95 – almost twice price of its closest rival. To anyone who doesn’t understand 80/20 that might sound insane – but we’re making money! Being twice the price, there’s twice the profit in our spinner as the next cheaper model. And nothing else outperforms our super spinner. If you’re playing the 80/20 game, and you want to get that high end customer, you really do need to shine like no other. Our spinner looks different, feels different (three times heavier than most!) and spins longer than anything else in the store. So we’re getting $79 sales with what most would consider a $5 product. Who doesn’t want more of that in their life!? Break your New Year’s resolutions? The smartest way to cut your taxes? Why do puppies have to grow up to be dogs? What if you could live the best life possible? Is your company drowning in data?